[EN] Joao is a 31-year-old Brazilian-Italian activist and social entrepreneur that has been working in different youth-led initiatives around the world for the last 17 years. Joao started volunteering at the age of 7, after joining the Scouts Movement in Brazil and he never stopped. At the age of 13, tired of being told he was too young to make a difference, he started a youth-led organization in his hometown Santos to advocate for the recognition of youth as agents of change, and create platforms and tools to enable a more meaningful engagement of young people in development and decision-making processes. At the age of 17, he led a yearlong campaign to establish the Municipal Youth Council in Santos, a platform that allows young people to advise on the city authorities on their city policies and programs. Once the Youth Council was created, Joao was elected member for two mandates. After that, Joao was part of the UN “Making Commitments Matter” process in Brazil. The initiative mapped, bench-marked and evaluated national youth policies in Brazil and identified the policy gaps, presenting a set of evidence-based policy recommendations to the National Government in 2004. Those recommendations included the need for creating more comprehensive National Youth Policies and an Inter-ministerial Secretariat dedicated to Youth, both were achieved on the following year (2005). Joao started to work internationally already in 2003, when he started to travel abroad to present the work of his organization, as well as to train young people from developing countries in project management and advocacy. Ever since, has has been working on different causes, campaigns, youth-led projects and youth movements in over 40 different countries, including: Argentina, China, Canada, East Timor, Indonesia, Italy, Kenya, Peru, Turkey, Serbia, Somalia and Zambia. For 5 years Joao acted as the Institutional Development Manager at Peace Child International headquarters in the UK, a youth-run international organization that champions the concept of youth-led development in over 150 countries. During his time in the management of the organization, Joao had the opportunity to work with an international group of youth volunteers to coordinate the Be the Change! Grants that supported over 300 youth-led projects in the global south, as well as he coordinate the World Youth Congress series (in special the editions hosted in Canada 2008, and Turkey 2010), as well as regional editions. Joao has been in very active in the process of recognizing youth participation within the UN System since 2004 and has consulted for different agencies of the UN system (including: UNDESA, UNICEF, UN-HABITAT, UNFPA, among others) trying to mainstream youth issues across the system. For two years (2013/2014), Joao worked as a Foreign Affairs Adviser at the National Youth Secretariat, part of the General Secretariat of the Presidency of the Republic of Brazil, where among other responsibilities, he acted as the UN focal point, and led the establishment of the Brazilian UN Inter-Agency Working Group on Youth, with representatives of UN agencies, government and youth civil society. Joao was also the focal point for the Post-2015 process, and was in charge of mainstreaming youth issues at the Brazilian Inter-Ministerial Working Group in charge of drafting the national position. Joao is a reference on the youth field in Brazil and internationally, and have already contributed many pieces on youth issues and particularly youth-led social entrepreneurship to a series of media outlets including MTV, Globo, BBC among others. For six years, Joao was a columnist for CAPRICHO magazine, one of the biggest magazines for youth in Brazil where he covered issues related to youth engagement and entrepreneurship, he was also a guest-blogger for the World Bank’s Youthink initiative talking about youth-led development and youth participation. Nowadays he is a correspondent on youth issues for different media outlets and publications in Brazil and abroad. Joao also has a significant track record working with social movements and civil society groups. Together with youth leaders from the developing world, Joao co-founded #ChangeMob (www.change-mob.org) a collective of youth social entrepreneurs and movement builders that seek to inspire, empower and strengthen transformative processes around the world. 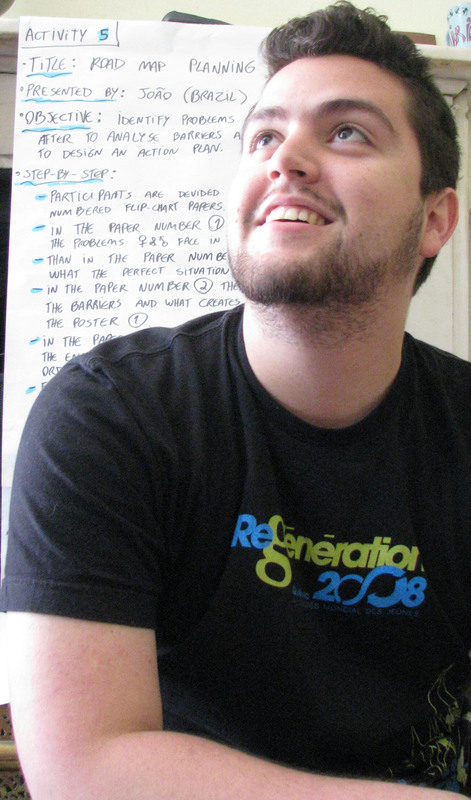 He is also the co-founder of Engajamundo (www.engajamundo.org.br) youth-led organization that helps young people from Brazil to engage and influence international negotiation processes and the Brazilian Youth Coalition on the Post-2015 (www.pos2015brasil.org). Joao served in the board of directors of CIVICUS: World Alliance for Citizen Participation (www.civicus.org) and GCCA – the Global Call for Climate Action (www.tcktcktck.org), among others. Currently Joao is working as the Youth Advisor to the United Nations in Somalia. Somalia has topped the list of most fragile states for six consecutive years and is among the poorest countries in the world. Currently, approximately 81,5% of the population is under the age of 35 (according to the Estimation Survey 2015, UNFPA Somalia). It is within this context that there is a need to assure youth issues and participation are mainstreamed and integrated into the planning and support of the development of programmes and policies, using the most up to date and relevant knowledge on critical issues such as youth employment, engagement in governance, peacebuilding, health, etc. Joao works in the office of the United Nations Deputy Special Representative of the Secretary-General, Resident and Humanitarian Coordinator for Somalia and provide the senior leadership of the UN in Somalia, the Government of Somalia and other agencies engaged in youth work in Somalia with support and advice in developing comprehensive policies and programmes for youth. He led the development of the UN Youth Strategy for Somalia (2015-2020), which articulates into a strategic and integrated framework all the different efforts, programmes and initiatives currently being implemented by the UN in Somalia. By unifying different efforts, the strategy aims to maximize coverage and impact and to ensure sustainability in the UN’s response to the needs and aspirations of young Somalis. Joao is supporting the finalization of the Somali National Youth Policy and is the permanent chair of the Inter-Agency Working Group on Youth Affairs.